Everyone loves a hero. Save someone from a burning building, and you’ll get your fifteen minutes of fame. 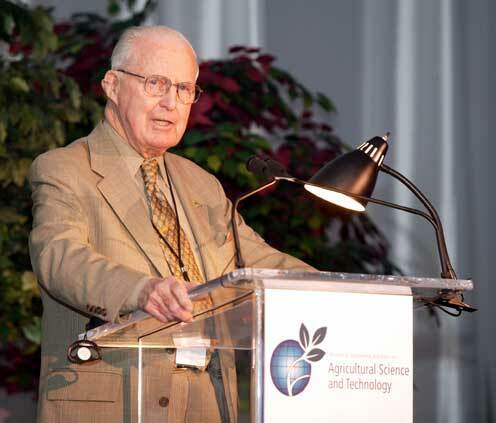 That’s why I’m always surprised that more people don’t know Norman Borlaug, who would have celebrated his 104th birthday on Sunday. He won the Nobel prize in 1970 and there’s good reason to think that his hacking efforts saved about a billion people from starving to death. A billion people. That’s not just a hero, that’s a superhero. To understand why that claim is made, you have to go back to the 1970s. The population was growing and was approaching an unprecedented four billion people. Common wisdom was that the Earth couldn’t sustain that many people. Concerns about pollution were rampant and there were many influential thinkers who felt that we would not be able to grow enough food to feed everyone. Paul Ehrlich, in particular, was a Stanford University biologist who wrote a book “The Population Bomb.” His forecast of hundreds of millions starving to death in the 1970s and 1980s, including 65 million Americans, were taken very seriously. He also predicted doom for India and that England would not exist by the year 2000. Here we are 40 or 50 years later and while there are hungry people all over the world, there isn’t a global famine of the proportions many people thought was imminent. What happened? People are pretty good problem solvers and Norman Borlaug — along with others — created what’s known as the Green Revolution.